For those parents needing to designate a single, alternate pick-up / drop-off address for their student for the 2011-2012 school year, the deadline for submitting Alternate Transportation Forms is Wednesday, June 15, 2011. Please remember that forms must be resubmitted each year by the June 15th deadline. Please click here for additional information and to access Alternate Transportation Forms for the 2011-2012 school year. A reminder that the exam schedule for seniors has been adjusted due to yesterday’s closure of the High School building. Please click here for the updated exam schedule, if needed. Board President Frank Pedicini (far left) and Vice President Joe Bertrand (far right) joined Principal Mark Kurz in honoring 16 Middle School students recognized in the Midwest Talent Search for their outstanding scores on the ACT and/or SAT tests. 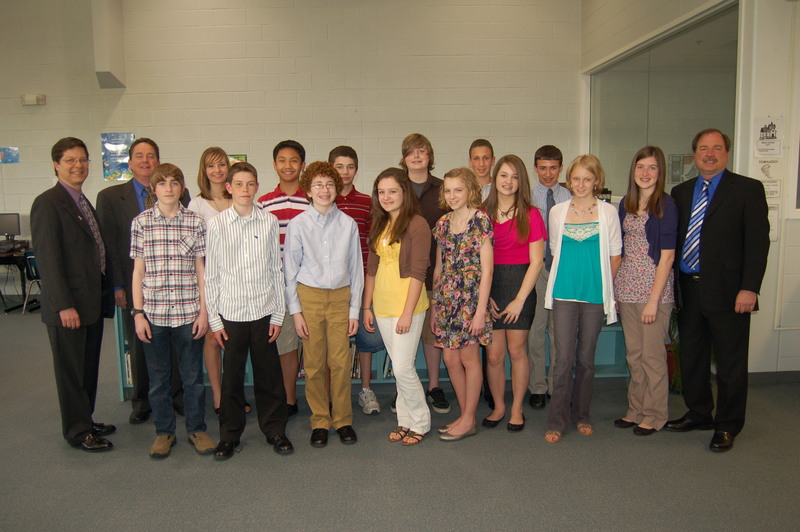 Sixteen Middle School students were honored for their achievements in Northwestern University’s Annual Midwest Academic Talent Search competition at last week’s Board of Education meeting. The Midwest Academic Talent Search enables students to participate in ACT and/or SAT tests that are typically taken by college-bound juniors and seniors in high school. Middle school students who achieve a score of 21 or above on the ACT and/or a score of 980 or above on the SAT are recognized as top performers. OFMS students recognized in this year’s national competition are: Yahia Ali, Connor Arendec, Jennifer Bertrand, Bailey Bihn, Zachary Buchta, Jared Chatham, Taylor Hassel, Kaylin Hynes, Emily Laycock, Stephen Miller, Courtney Nelson, Emily Raffay, Jared Yant, Ethan Novilla, Emily Olszewski, and Michael Doherty. Congratulations to each of these students and to their families! Additionally, we want to recognize our teachers who worked with these exceptional students along their path up to this point. It is the great education provided at each level, coupled with support in the home, that prepared these students for this achievement, and that will continue to help them thrive in the future. Congratulations again! OAPT North Region Director Debbie Miller, "Driver of the Year" Joyce Bigley, and Olmsted Falls Director of Business Affairs Tim Atkinson. Congratulations to Olmsted Falls school bus driver Joyce Bigley on being named “Driver of the Year” for the entire North Region of Ohio by the Ohio Association for Pupil Transportation (OAPT). Mrs. Bigley was presented with the “Driver of the Year Award” at last week’s Board of Education meeting by Debbie Miller, OAPT North Region Director and Transportation Supervisor for Wadsworth City Schools. In attendance to help recognize Mrs. Bigley were family, friends and fellow bus drivers. 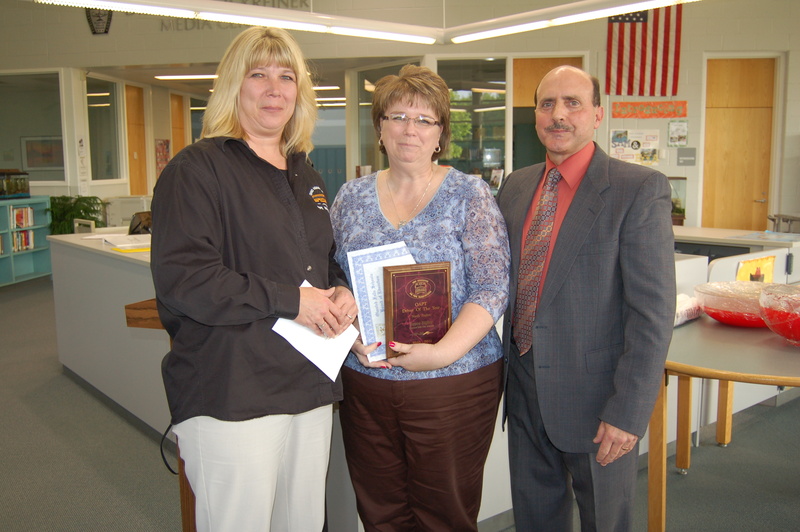 Mrs. Bigley also earned the Olmsted Falls “Driver of the Year” award from her colleagues this year. Often the first and last Bulldog staff member they come into contact with, Mrs. Bigley makes a positive impact on students and parents each school day. Congratulations! As part of the end of the year Field Day activities at Olmsted Falls Intermediate School, the K-Kids Club has organized a “Kick It for Cancer” Kickball Tournament for 4th graders. Kick-It is a national fundraising program that raises money for children’s cancer research. All proceeds raised by OFIS students will benefit CureSearch for Children’s Cancer. K-Kids have been planning for next week’s local event with an awareness and fund raising campaign, which has featured information on the morning announcements as well as an official “Kick It” kick-off assembly held last Friday. 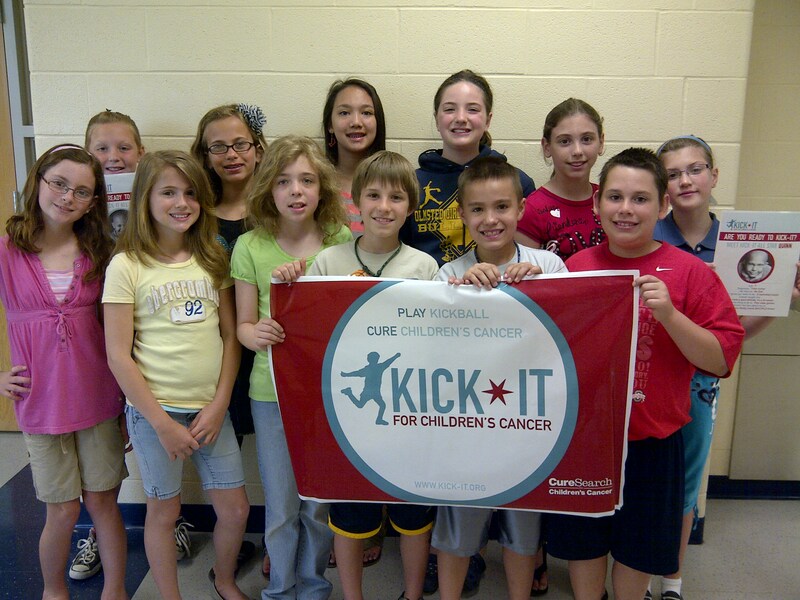 This coming Wednesday, June 1st, 4th graders will take the fields at OFIS beginning at 8:20 a.m. through approximately 11 a.m. for the first-ever “Kick It for Cancer” Kickball Tournament in Olmsted Falls. By organizing this game, Olmsted Falls’ students are helping thousands of children fighting cancer locally and across the country. Way to go K-Kids! The Olmsted Falls High School academic team, left to right, Sohan Vartak, team captain Jim Coury, and Marty Mendenhall, won the 21st annual Academic Championship on the Scholastic Games of Lorain County broadcast of May 23rd. 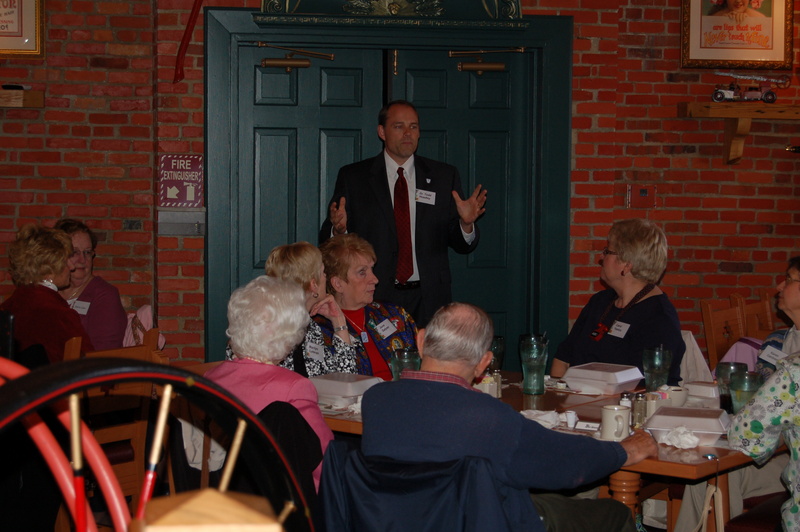 The program was heard on Elyria's WEOL (AM 930). Following the highest succession of winning scores in the history of the program, the academic team from Olmsted Falls High School defeated defending champion Lake Ridge Academy this past Monday by a score of 510 to 330 in the Scholastic Games Championship. The radio quiz series has been heard on WEOL radio (AM 930) since 1990 showcasing teams from area high schools. This year, sixteen different schools have been heard on the weekly series since January. The Olmsted Falls team, consisted of Jim Coury, Marty Mendenhall, and Sohan Vartak. Team captain, Jim Coury, was presented with the program’s “Standout Scholar Award” Based on his performance through the entire program. 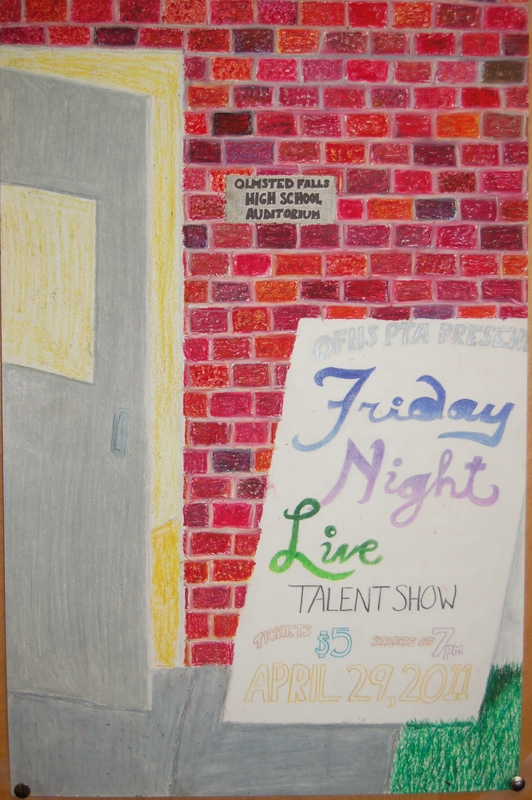 Olmsted Falls High school held its annual May Art Show last Friday featuring work by students, alumni, staff, and community members. A large variety of visual arts, photography, and product manufacturing pieces were on display as students and visitors toured the show, held in the gymnasium, throughout the day. 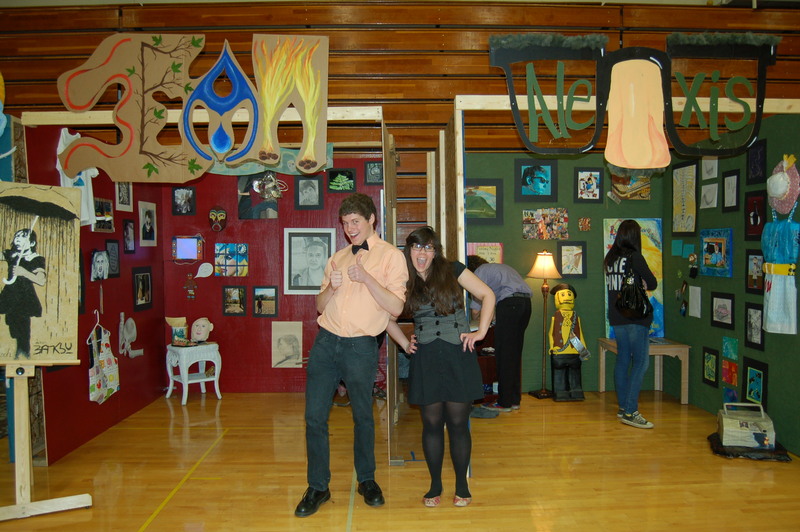 Always a treat to explore are the special booth exhibits created by Olmsted Falls seniors. Kudos to our graduating bulldogs and all of the show participants for their creativity and talent! A special thank you to Olmsted Falls Kiwanis Club which sponsors the May Show! To view additional photos from this year’s May Show, please click here. 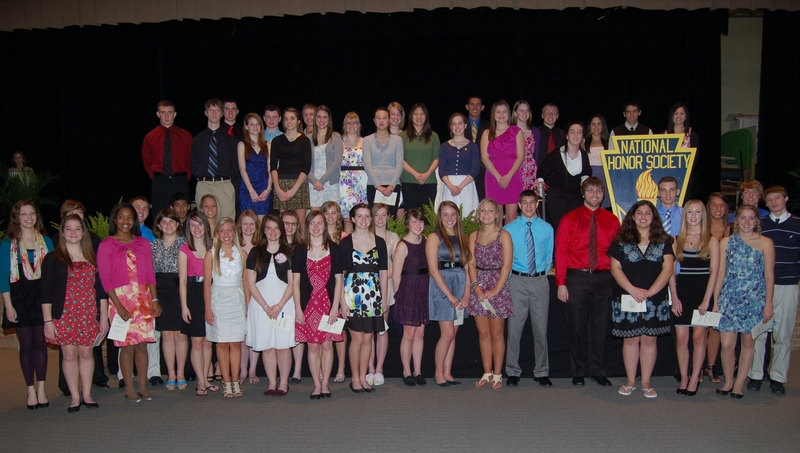 More than 350 OFHS students attended the 2011 Prom earlier this month. This year’s OFHS Prom event was held at Windows on the River in downtown Cleveland. Students were transported to and from the event on busses. 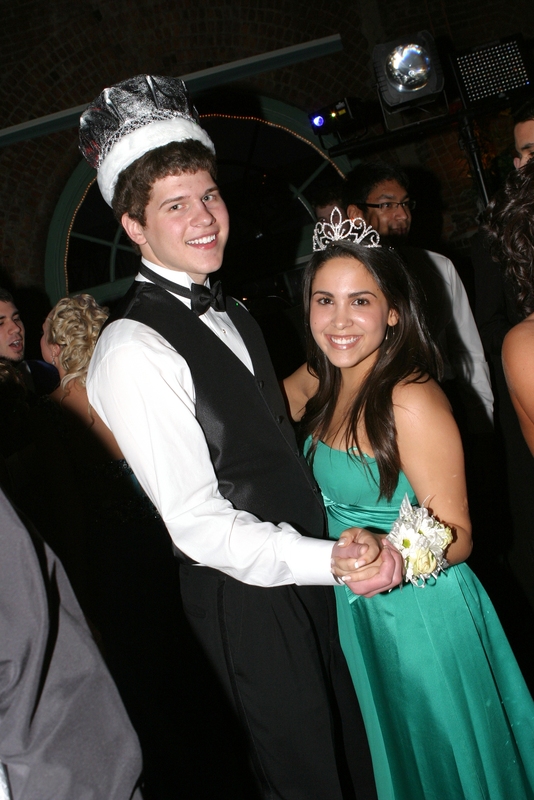 Congratulations to Sean Hirsch and Tatiana Faria who were named this year’s Prom King and Prom Queen. The 2011 OFHS Prom was followed by a Post-Prom event at the High School. Many thanks to the students, staff and parents who worked so hard to make this year’s Post-Prom a success! To access the registration form, please click here. 2011 Safety Town Registration/Payment Deadline: June 1st. For additional information on Olmsted Safety Town and the OECPTA, please visit the OECPTA website at www.oecpta.org. Save the Date! The Olmsted Falls Schools Endowment and Alumni Association will host its annual John Sanders Memorial Golf Outing on Saturday, July 16th. Tee times begin at 9:30 a.m. All proceeds benefit the scholarships for OFHS graduating seniors. For additional information, please click here. The Olmsted Falls Athletic Department will offer a variety of Summer Sports Camps for students in grades 3 to 12. All information and registration forms have been collected and posted together on the District website. 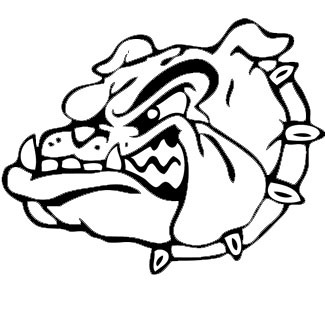 Please click here for a link to the Bulldog Summer Sports Camp information page. Preparing for the 2011-12 School Year: For more information or forms, please call your school’s clinic. Health Care Action Plans/Medications at School: If your child has a medical condition which may require treatment at school such as asthma or severe allergies, etc. you will receive a Health Care Action Plan form from your child’s clinic staff. These action plans, which are completed by you and your physician, provide staff with detailed care information should your child become ill at school. If your child will need to take a medication at school a medication order form is available on the district’s website. Severe Food Allergies: The district hosted a meeting last week for parents and staff to discuss improvements to the district’s Severe Allergy protocol. Consensus was reached on a “Nut Free Snack List” that will be used in Allergy Free classes at the ECC/Falls/IS. Copies of the snack list and as pertinent, the revised protocol, will be sent to parents of students who are assigned to these classes prior to the start of the school year. Medication Pick Up: If your child has medications at school please arrange for an adult to pick them up prior to June 16th. You will receive a notice from your clinic as to days/times. Medications not picked up by the 16th will be disposed of. 7th grade students: Ohio law requires a Dt (Diptheria, Tetanus) booster vaccine be given prior to entry into the 7th grade. For a preview of summer programs offered by Cuyahoga County Public Library, please click here. Attention Parents! Border’s Books is offering a summer reading program for students. The “Double Dog Dare Challenge” is for children ages 12 and under. Encourage your child to read 10 books and they get a free book from Borders! Simply click here to print the form. Your child tracks his/her summer reading and turns it in at Borders. Enjoy! OLMSTED TOWNSHIP PRESENTS: “RAIN BARREL WORKSHOP” – Thursday, June 9th, 3:00 – 4:30 at the Olmsted Township Hall; and 6:30 to 8:00 p.m. at Olmsted Falls Middle School Cafeteria. Learn how to harvest rain water for all your garden needs and to combat Storm Water Pollution in your community. Click here for more information. OLMSTED FALLS RELAY FOR LIFE EVENT – Saturday, June 11, 2011 from noon to noon Sunday, June 12, 2011 at Olmsted Falls High School. It is never too late to join this great cause and register as a survivor or to start your own team. For questions, please call Co-Chairs Michelle LaGruth at 440-476-4697 or Lisa Brady at 216-870-8256. Due to an electrical failure, Olmsted Falls High School is closed today. All other district buildings will be open. Congratulations to Olmsted Falls Pre-Engineering students Matt Bender and Connor Bailey! 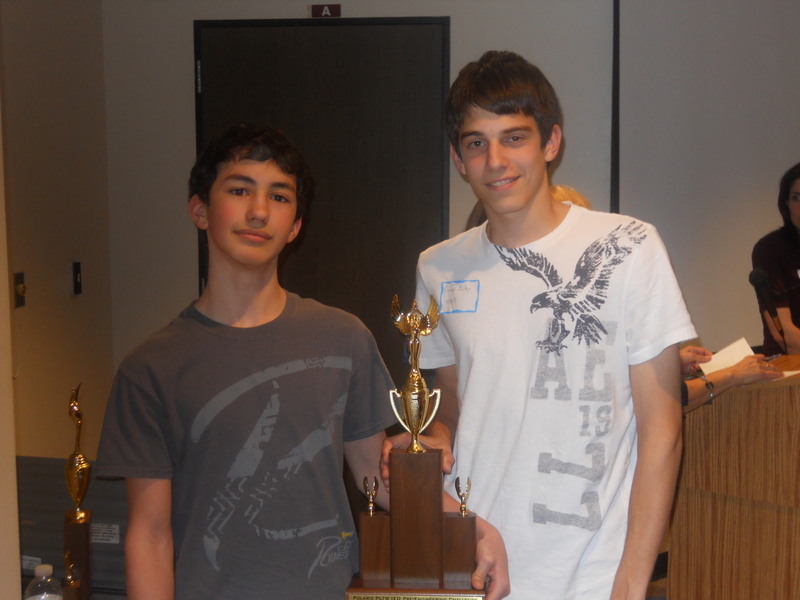 Last Friday, May 13th, they competed in the 1st Annual Polaris PLTW competition and won 1st place. Matt and Connor competed in the IED competition, where they were given the assignment to design four objects that could be used in a fish tank and make an oral presentation about their products. Matt and Connor competed against teams from Berea, Midpark, Brooklyn, Fairview, and Polaris. Please feel free to contact Mr. Kurz at either 440-427-6201 or by email at mkurz@ofcs.net, in the event you have any questions regarding this informational meeting. Thank you! Riley Alton & Tristan MacIvor worked at the Metroparks during the morning session. Several seventh graders were willing to act on their knowledge of environmental problems by participating in the Rocky River Reservation garlic mustard pull – even though the event took place on one of the few sunny Saturdays we’ve seen lately! 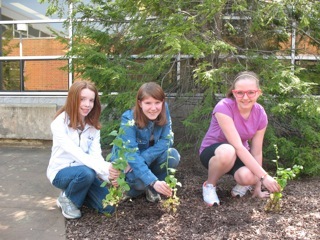 Emily Waugh, Brianna Wojtowicz & Sydney Martin showed fellow students the garlic mustard plant back at school on Monday. Garlic mustard is an invasive species that reproduces rapidly thus crowding out native wildflowers. The students learned that just pulling the plant out by its roots and leaving it on the ground wasn’t sufficient since the seeds will grow into new plants the following year. 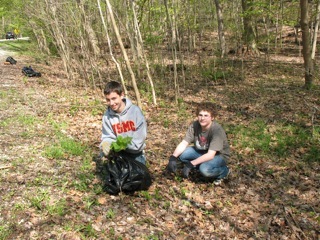 All of the pulled plants had to be bagged in order to completely remove the invasive species. Garlic mustard is endemic throughout Ohio – you can find it in your own backyard, on school grounds (we are always on the look-out! ), at soccer fields, the Cleveland Art Museum – it’s everywhere! If you see it, pull it out and throw it in a trash bag – you will be saving our native plants! 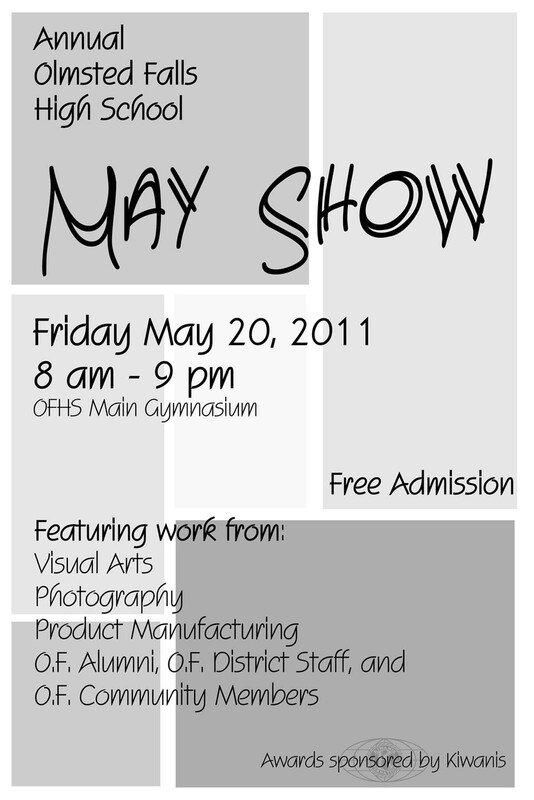 Don’t miss the annual May Show at Olmsted Falls High School THIS FRIDAY, May 20th from 8:00 a.m. to 9:00 p.m. in the OFHS Main Gym. The May Show features work from visual arts, photography, product manufacturing, O.F. alumni, O.F. staff, and O.F. community members. 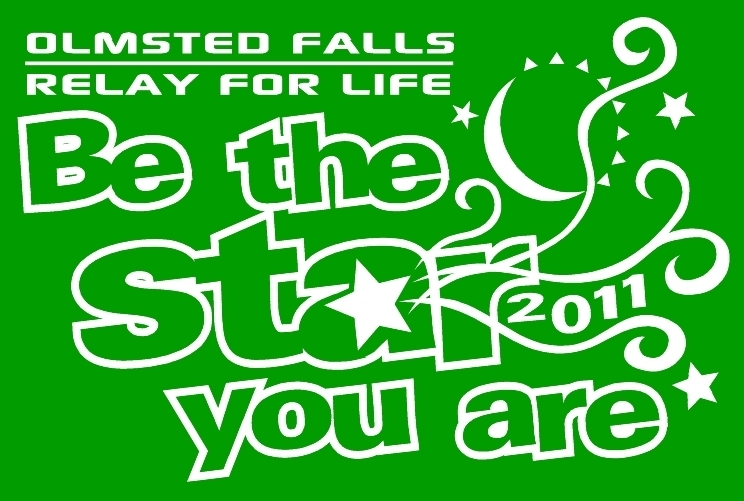 Help support Olmsted Falls 8th Grade D.C. trip fund. Stop by Drug Mart at the corner of Bagley & Columbia THIS SATURDAY, May 21st between 11 a.m. and 1 p.m. to enjoy hot dogs, chips and pop! All proceeds go to the 8th Grade Washington D.C. trip fund. To download the official flier, please click here. Last Sunday, May 15th, a group of 48 Bulldog Football Players and coaches volunteered their time at the Ronald McDonald House in Cleveland. The players were responsible for duties that included a number of outdoor tasks from pulling out the hedges in the front of the complex to weeding and spreading mulch. A great effort was made by all to help out for a very worthy cause. Please click here to see pictures of our players and coaches at work! Great job Bulldogs! REGISTER TODAY! Olmsted Early Childhood PTA still has open spots for its summer Safety Town program. OFIS CAREER DAY SUCCESS – THANK YOU VOLUNTEERS! Thank you again to all of our volunteers! The students and staff very much appreciated your time and effort! To view additional photos from the OFIS Career Day event, please click here. 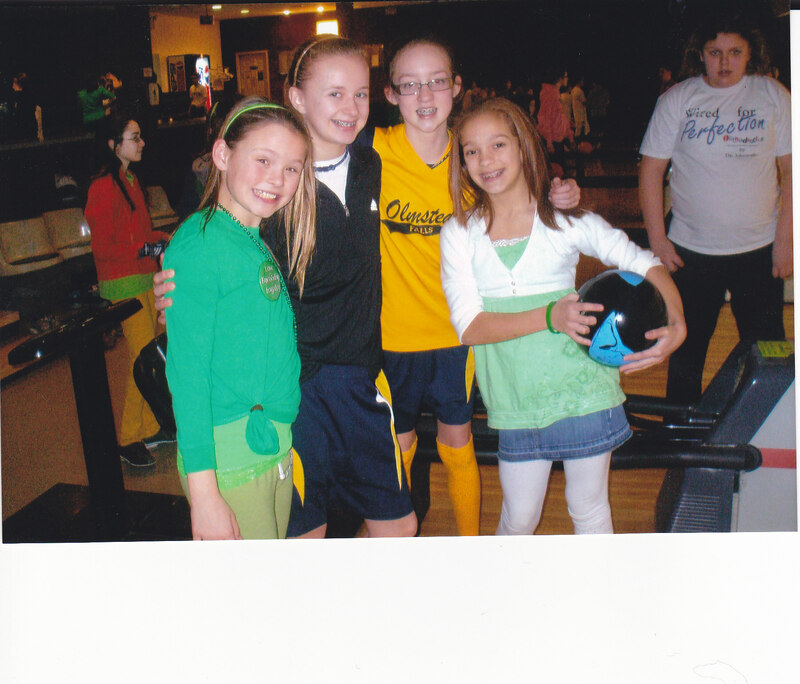 The physical education department at Olmsted Falls Middle School was awarded a $700 grant to help pay for all 6th grade students, as well as adapted physical education students, to attend a bowling outing at Buckeye Lanes earlier this spring. This special field trip was part of the lifetime sports unit, in which students were taught how to keep score without the use of technology. Kudos to OFMS physical education teachers Brigid Radigan, Laura Sheldon and Steve Hunter for securing these grant funds to enhance the curriculum integration of math and physical education with a hands-on experience for their students! Olmsted Falls students are making headlines in the local media. Attention Parents! Border’s Books is offering a summer reading program for students. The “Double Dog Dare Challenge” is for children ages 12 and under. Encourage your child to read 10 books and they get a free book from Borders! Simply click here to print the form. OLMTED FALLS RELAY FOR LIFE EVENT – Saturday, June 11, 2011 from noon to noon Sunday, June 12, 2011 at Olmsted Falls High School. It is never too late to join this great cause and register as a survivor or to start your own team. For questions, please call Co-Chairs Michelle LaGruth at 440-476-4697 or Lisa Brady at 216-870-8256. Congratulations to Falls-Lenox teacher Michelle Schoenhofer, who was among a small group of educators honored last week with a 2010-2011 Crystal Apple Award presented by The Plain Dealer and sponsored by Bryant & Stratton College. Ms. Schoenhofer was selected for this honor during the first recognition period earlier in the school year. The awards banquet took place on May 5th at The Plain Dealer. Ms. Schoenhofer was nominated by Bulldog parent Paula Grant, who also attended this very special recognition event with her daughter. Congratulations again to Ms. Schoenhofer! 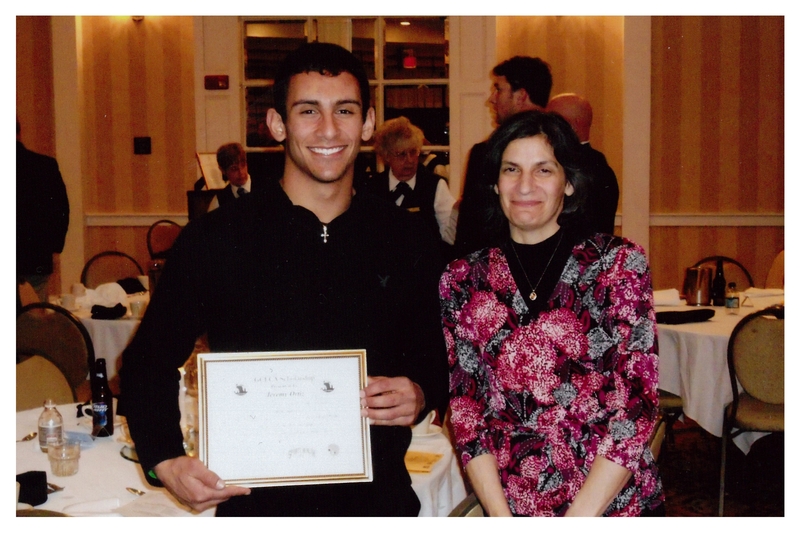 C ongratulations to OFHS seniors Jim Coury (left) and Mike Coury (right)! Following recognition as National Merit Finalists earlier this year, Jim and Mike Coury were notified last week that they have each been awarded a $2,500 National Merit Scholarship as part of this prestigious program! Congratulations and continued success to both Jim and Mike! 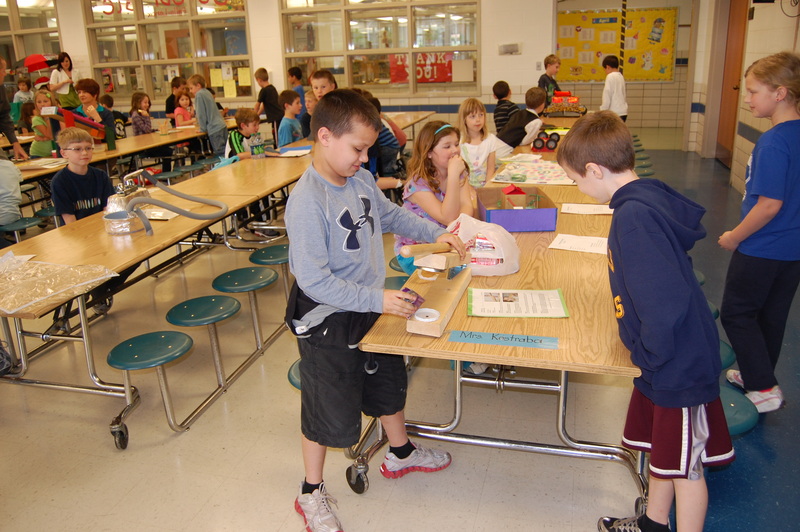 Second grade students at Falls-Lenox participated in the school’s annual Invention Fair last week, a two-day event showcasing student inventions. Student creativity and innovation was on display for fellow students, staff and parents. 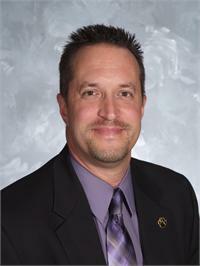 Congratulations to Olmsted Falls School District Assistant Superintendent Dr. Jim Lloyd who was honored last week by the GCEDC at a special ceremony held at Cleveland State University. Dr. Lloyd was the first recipient of the Emerging Educator Award, which was established to recognize energy and impact of education leaders in promoting highly qualified professional development. Congratulations again to Dr. Lloyd! REMINDER: Payment for all students registered in this summer’s Safety Town sessions is due by May 15th. Last week, senior Bulldog volleyball player Michaela Hawkins signed a letter of intent to play volleyball for West Liberty College. 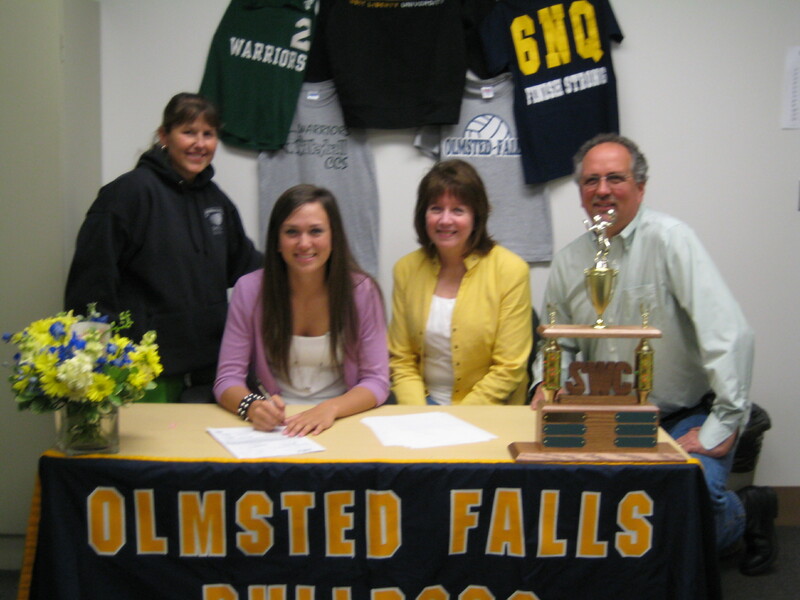 Michaela came to Olmsted Falls this past season as a senior. She has earned 9 varsity letters in her high school career in volleyball, basketball and softball. Michaela will attend West Liberty in the Fall to pursue a degree in Nursing while participating on the volleyball team. She will be the 5th generation in her family to attend West Liberty. 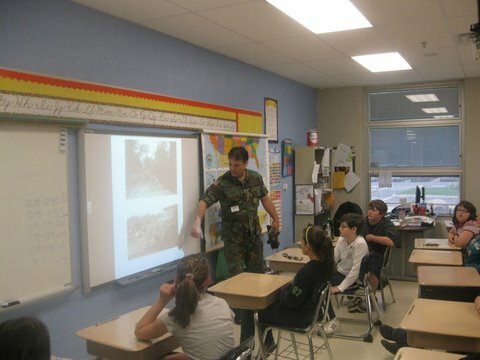 Olmsted Falls Intermediate School will host its annual Career Day on Tuesday, May 17th from 8:30 a.m. to 10:30 a.m. OFIS is looking for additional speakers to add to our list of guests who will meet with kids in the classroom to talk about their interesting careers. 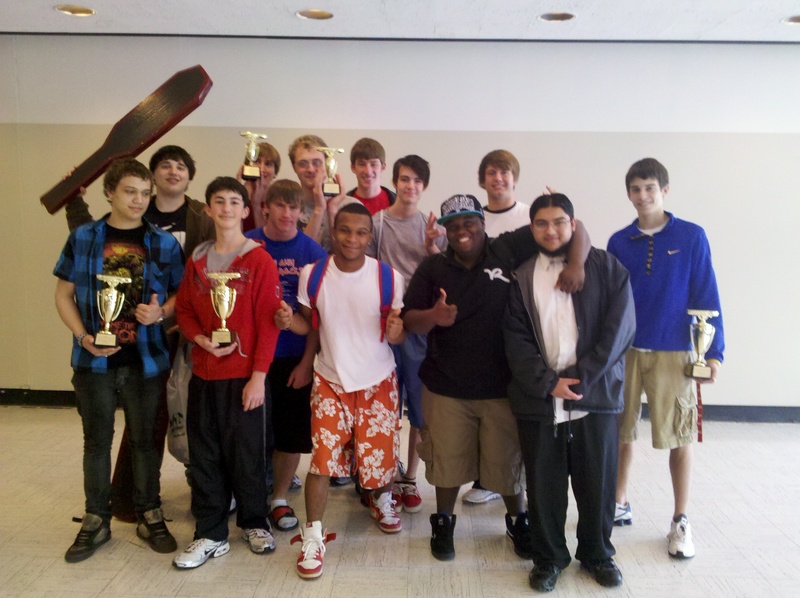 Last week, students from the Pre-Engineering Class at Polaris and Olmsted Falls competed in the Tech Prep Cardboard Canoe race at Tri-C. Bulldog participants made a strong showing as they showcased their engineering skills with cardboard canoes that were both fast and well-designed. District officials reached out to parents earlier this week with an on-line survey regarding the 2.8 Mill P.I. Levy. Bulldog parents were e-mailed a link to participate in the six-question survey, which focuses on levy awareness, communication materials and methods, and the structure of the levy itself. Thank you to the more than 300 parents who have already completed the survey since Monday. This feedback will be a valuable tool for administrators and Board of Education members as the next steps for the issue are determined. The on-line survey regarding the levy will remain open through this Friday, May 13th. If you need to have the link resent, please contact District Communications Director Kim Petrina via e-mail at kpetrina@ofcs.net. Olmsted Falls School District received not one, but two positive endorsements from The Plain Dealer regarding the 2.8 Mill P.I. Levy. In addition to a formal editorial endorsement of the issue prior to the May 3rd election, The Plain Dealer also ran a positive follow-up editorial this past weekend. To read this latest PD editorial, please click here. The sport of rugby has been incorporated into the physical education curriculum at Olmsted Falls Middle School this year. The sport has been well received by students, and its benefits were recently profiled by HighSchoolSports.net through an interview with OFMS Physical Education Teacher Brigid Radigan. Please click here for the link to the story. A heartfelt thank you to everyone who helped or donated blood at last week’s HS Blood Drive, especially Tatiana Faria, Christy Otonaga, Tori Alai, Dave Godfray, Tracy McGrain, Mercedez Hathcock, Jan Stetz, Ellen Bertrand and Jeanne Mahoney. Students and staff donated 71 pints of blood to help save lives and earned $1,000 in scholarship money this year. 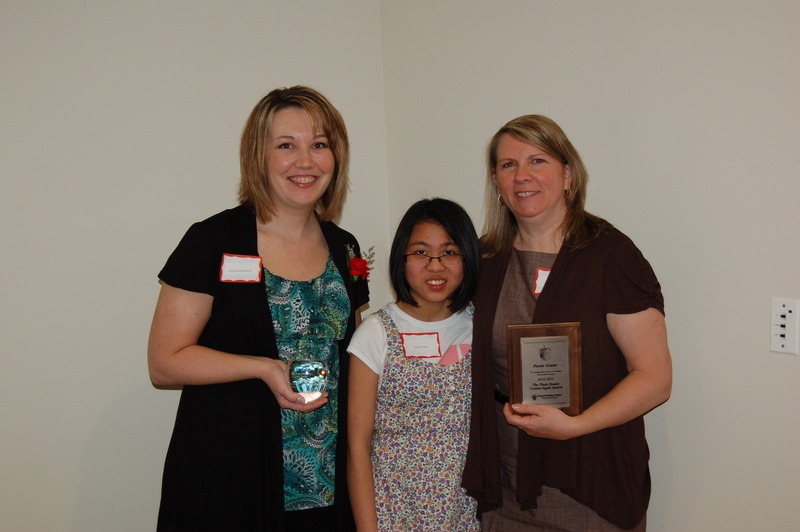 Congratulations to Christy Otonaga and Ellen Disrude, the 2012 Red Cross Scholarship Recipients who each received $500. Kristy and Ellen were randomly chosen from among all the students who gave so selflessly to others by working or donating blood at both of the HS drives this year. Cuyahoga County Public Library is seeking input on the future of the Olmsted Falls Branch. As you may already be aware, CCPL has a Facilities Master Plan that will reduce its operating costs to ensure excellent library services for years to come. Replacement of the existing Olmsted Falls Branch is part of this plan. The current location is costly to operate and does not meet customers’ needs. CCPL intends to move forward with plans for an approximate 6,000 square foot replacement branch. This project is currently in the design phase. Olmsted Falls Middle School was an instrumental part of the success of this year’s Pasta for Pennies program, which helps raise awareness about blood cancers while raising funds for a cure. 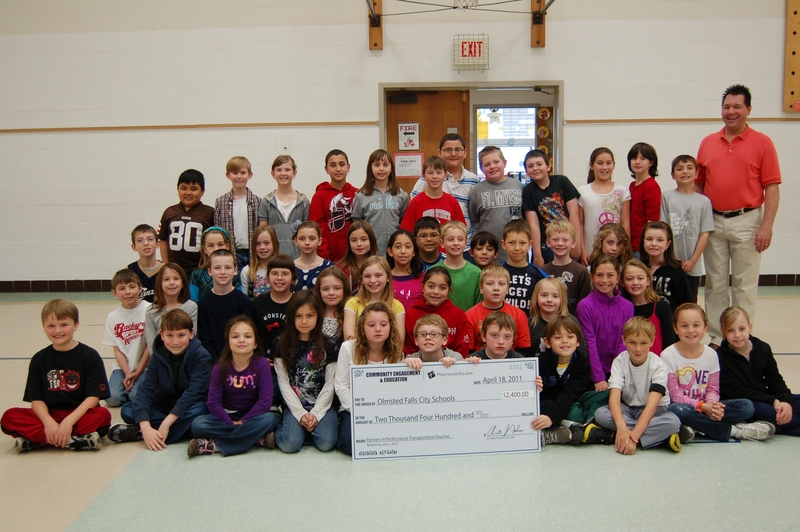 Students at OFMS generously contributed $4,545.79 to this program, which is sponsored by The Leukemia & Lymphoma Society. Since OFMS began supporting the Pasta for Pennies program several years ago, OFMS Bulldogs have raised a total of $24,221.86 for this effort! Congratulations to the staff, students and parents at Falls-Lenox on the successful Carnival for a Cure hosted in the building last month. More than 300 students and more than 340 parents attended this first-time event which featured a wide variety of family friendly activities. This was truly an old-fashioned school carnival that brought together parents and kids for an evening of fun. In total, the event raised approximately $3,100 for the upcoming Relay for Life event, which benefits The American Cancer Society. Many staff members, parents and local businesses pitched in to make this event a huge success. Special thanks to Angelina’s, Shaker’s IGA, Kiwanis and PTA! “Help! My Child is Being Cyber Bullied” Workshop at Strongsville Library Branch – TOMORROW, Thursday, May 12th from 6:00 – 8:00 p.m. – This workshop will present strategies and interventions that work to stop cyberbullying now! Presenter: Todd Walts, President/CEO, CampusImpact, Inc. Cuyahoga County Public Library, Strongsville Branch, 18700 Westwood Drive, Strongsville. Boy Scout Troop 201 Annual Flower Sale – This Saturday, May 14th ( 8am-2pm) at the Jenkins Center located at the corner of Columbia Road and Main Street, right next to the Olmsted Falls Library. The Boy Scouts will have hanging baskets and flats of annual flowers available at good prices. Stop by, shop locally, & support Scouting! Contact Mike or Sharon Knaggs, 440-816-0372, with questions or visit www.troop201.org. please call Co-Chairs Michelle LaGruth at 440-476-4697 or Lisa Brady at 216-870-8256. Unofficial election results indicate 46% of votes cast in favor of the 2.8 Mill P.I. Levy, with 54% of votes cast against it in yesterday’s election. Passage of this P.I. Levy – which would not increase the current level of taxation – was a critical component to the District’s financial health. Looming cuts at the state level made passage of the 2.8 Mill P.I. Levy even more urgent. District officials will discuss next steps within the week. The 2.8 Mill P.I. Levy could be placed back on the ballot in August or November of 2011. Passage of this 2.8 Mill P.I. Levy would be needed before the end of calendar year 2011 in order to maintain the ability to redirect critical funding without increasing the current level of taxation. Parents and residents are encouraged to post questions regarding the 2.8 Mill P.I. Levy here on the District’s blog. It is imperative that the education campaign about the benefits of this strategically timed levy continues. 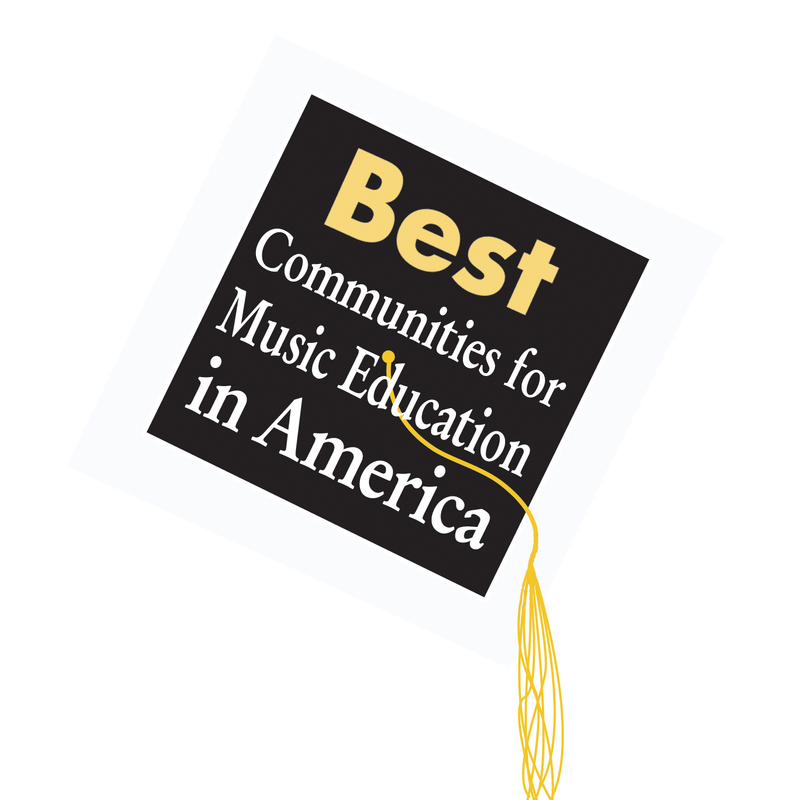 For the fifth year in a row, Olmsted Falls School District has been named one of the “Best Communities for Music Education in America” by a national survey sponsored by the National Association of Music Merchants (NAMM) Foundation. The school districts named by the NAMM Foundation demonstrate an unwavering commitment to providing music education for their students – even during these challenging economic times. Congratulations to the staff, students, parents and community members who help make our music program a nationally recognized success! 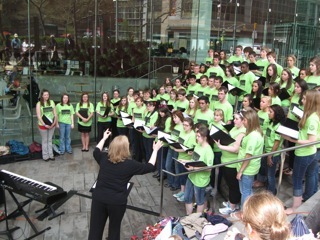 Students in the OFHS Chorale and Wind Ensemble traveled to New York City for special performances last week. One of the highlights of the trip was a performance in front of the world-renowned Lincoln Center. Above, OFHS Choral at Lincoln Center. 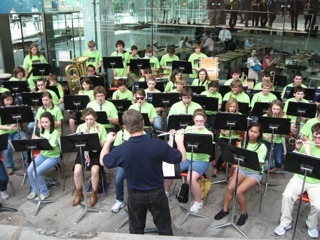 At right, OFHS Wind Ensemble at Lincoln Center. These talented music students represented Olmsted Falls School District with great poise and pride. Well done! The 8th grade team placed 1st out of the 41 schools in attendance, and several of the teams’ individual writers were recognized for outstanding achievement and placed in the top 20% of all competitors, qualifying them for the State competition. 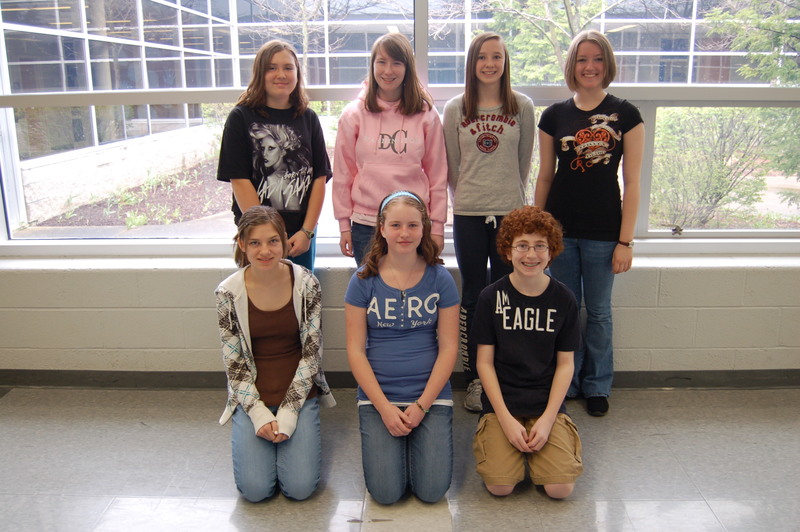 Pictured at left are the members of the 8th Grade Power of the Pen Team: Back Row (L to R) – Teresa Wang, Breanna Palkovic, Chloe Topolski, Kat Karolak, and Miss Scalley; Front Row (L to R) – Madeline Finau, Kathryn Lesiak, Julia McFadden, and Chris Vandrasik. Special congratulations go to State-bound 7th graders: Zach Buchta, who came in 4th place overall and received a “Best of Round” award; Emmy Olszewski, who came in 10th place; and Christina Pedicini, whose strong performance also earned her a place at the state competition. The eighth grade state qualifiers include Madeline Finau (4th place overall), Kathryn Lesiak (5th place), Breanna Palkovic (14th place), and talented writer Chloe Topolski. Members of the 7th Grade Power of the Pen Team are pictured above: Back Row (L to R) – Madeline Finau, Kathryn Lesiak, Breanna Palkovic, and Chloe Topolski; Front Row (L to R) Christina Pedicini, Emmy Olszewski, and Zach Buchta. Good luck to all of these fantastic young writers as they prepare for the Power of the Pen State tournament hosted by the College of Wooster on Friday, May 27th! The OFHS Baseball Team will host its 2nd Annual Youth Baseball Day TOMORROW, Thursday, May 5th during its game against Berea. There will be a huge five-sport inflatable, radar gun station, and more! A name will be drawn each inning to warm-up the left fielder and keep the game ball! This is a great event for our young Bulldog baseball fans! Hope to see you there! OFHS Principal Dr. Bob Hill and OFMS Principal Mr. Mark Kurz jointly mailed a letter to all parents of high school and middle school students this week. The subject of this important letter was “social media” and issues that the District has been encountering with students’ use of Facebook as well as texting. This letter is an attempt on the District’s part to reach out to parents for their help in this matter. While the District is limited from a discipline (reactive) standpoint, due to the social media activities taking place outside of school grounds, it is never limited in trying to work with parents, in a proactive manner, in order to prevent issues. Access to Facebook is blocked on all District computers, however the impact of activities on Facebook outside of school inevitably spills into the regular school day. To read the letter that was mailed home to all parents of Middle and High School students, please click here. Parents, staff and interested community members are invited to a meeting to discuss aspects of the District’s “Severe Food Allergy Protocol” on Wednesday, May 11th from 3-4:30 p.m. in the Falls-Lenox cafeteria. Please call Darla Haviland, R.N. District Nurse at 440-427-6364 for more information. 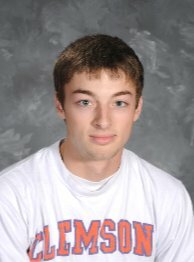 Congratulations to senior Zach Sanford, who recently represented Olmsted Falls High School and Polaris Career Center at the State Skills USA competition in Columbus. Zach took first place and was presented with the Gold medal for the Criminal Justice Competition! Zach will be headed to Kansas City, Missouri for National Competition during the week of June 18th. Congratulations and good luck Zach! A special thanks to Mr. Moore for hosting the Talent Show. Also, thanks to Carson Moore for performing the National Anthem. Tatiana Faria and Sean Hirsch were our student judges and our faculty judges were Mrs. Reimer and Mrs. Gulden. Great Job Everyone!!! 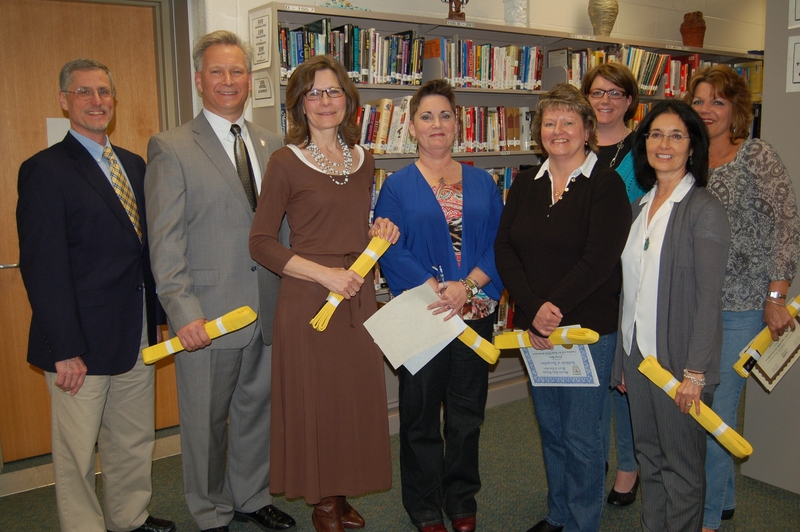 Olmsted Falls Schools Endowment and Alumni Association hosted its annual Retired Staff Luncheon this past Monday. 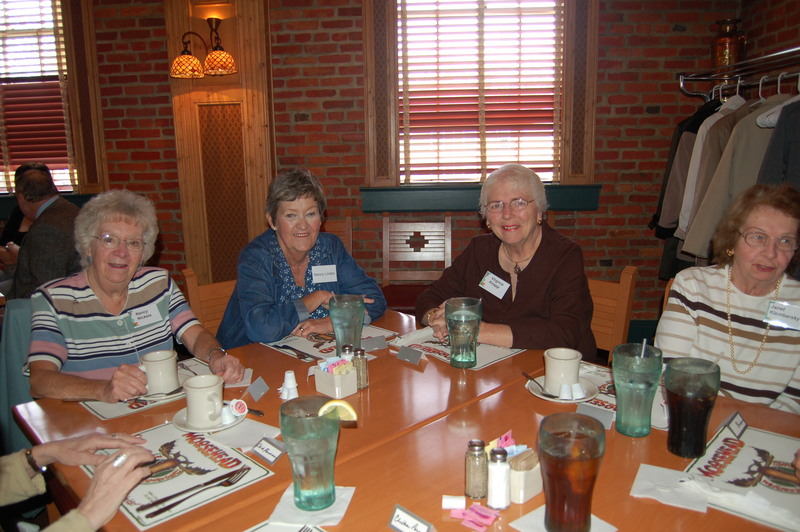 Approximately 25 retired Bulldog staff members attended and enjoyed the opportunity to catch up with former colleagues. Superintendent Dr. Todd Hoadley also attended, expressing heartfelt thanks to the group for their role in creating and maintaining the District’s tradition of excellence. 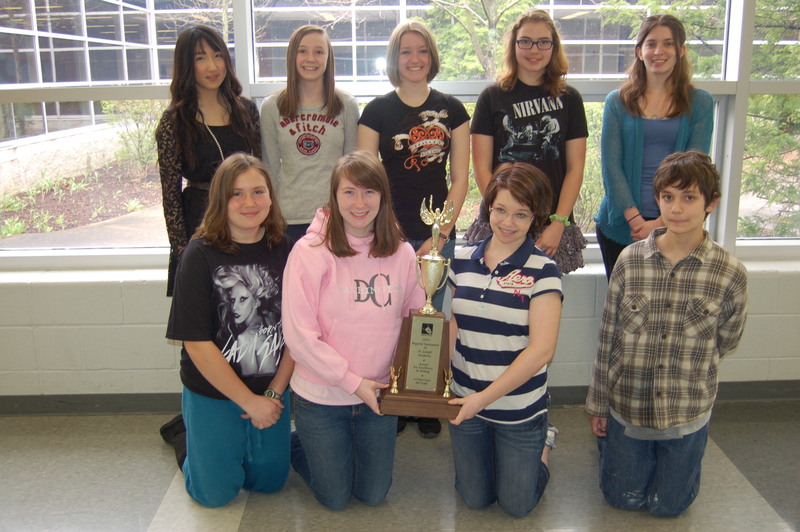 Last Saturday, the Academic Team traveled to Cloverleaf for the Ohio Academic Competition Regionals. The team won its Region in dramatic fashion with a final match that went into overtime. 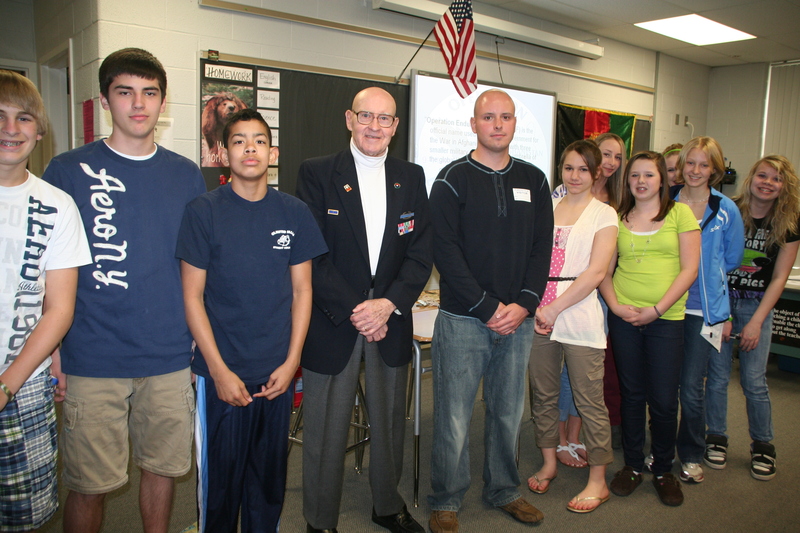 Students participating included Jim Coury (captain), Mike Coury, Sohan Vartak, Marty Mendenhall, and Emily Nageotte. These students will participate in the State OAC Competition this coming Saturday in Columbus. Last Sunday, the Academic Team participated in the semi-finals and the finals of the Scholastic Games of Lorain County for WEOL Radio. The team’s semi-final match was against Vermilion. The score was 680-240 in favor of the Bulldogs. The team then competed in the finals against defending champion Lake Ridge Academy. The Bulldogs again prevailed with a 510-330 victory to claim the Scholastic Games title for 2011. These episodes will air on May 16 (versus Vermilion) and May 23 (versus Lake Ridge Academy) on WEOL Radio 930 AM at 6:05 pm. The broadcasts are saved as podcasts and can be listened to at any time. The podcasts are available on their webpage http://www.weol.com click on Scholastic Games. The podcasts are posted to the website after they air on the radio. From the victories on Scholastic Games this year, this team brought back over $3500 in college scholarship money that will be awarded to deserving seniors attending the schools offering the grants. These are $500 tuition credits to: Oberlin College, Ohio Weslyan, Baldwin Wallace, Case Western Reserve, Lorain County Community College, Notre Dame of Ohio, and Ashland University. These scholarships are awarded to seniors attending these schools and not to the students on the team. 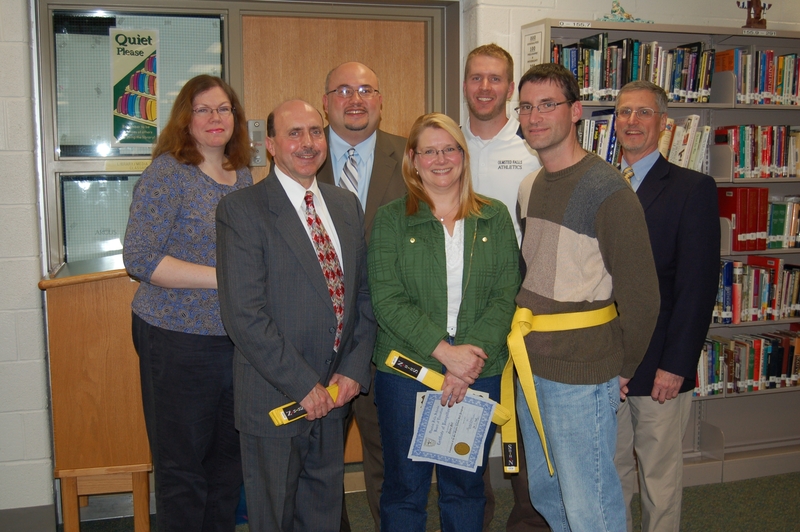 The students participating for Olmsted Falls were: Jim Coury, Sohan Vartak, and Marty Mendenhall. Jim Coury was named the standout scholar for both broadcasts. Writeups from the matches can also be found on the http://standoutscholars.com/. OFHS Baseball Team 1st Annual Cure Tay-Sachs Classic – This Saturday, May 7th at Olmsted Falls Field 3. Olmsted Falls, North Royalton, Midview and Clearview will compete in this first annual event to benefit the Cure Tay-Sachs Foundation. A Fausto Carmona signed baseball, Shin-Shoo Choo signed baseball, Carlos Santana signed baseball and Bob Feller signed poster will be raffled off at the Classic. One after each game – tickets will be a $1 each – all proceeds will go towards CTSF! Click here for event flyer which includes game schedule. Boy Scout Troop 201 Annual Flower Sale – Saturday, May 7th (9 am-dark); Sunday, May 8th ( 8am-2pm); and Saturday, May 14th (8am-2pm), at the Jenkins Center located at the corner of Columbia Road and Main Street, right next to the Olmsted Falls Library. The Boy Scouts will have hanging baskets and flats of annual flowers available at good prices. Stop by, shop locally, & support Scouting! Contact Mike or Sharon Knaggs, 440-816-0372, with questions or visit www.troop201.org. OLMTED FALLS RELAY FOR LIFE EVENT – Saturday, June 11, 2011 from noon to noon Sunday, June 12, 2011 at Olmsted Falls High School. It is never too late to join this great cause and register as a survivor or to start your own team. For questions please call Co-Chairs Michelle LaGruth at 440-476-4697 or Lisa Brady at 216-870-8256. The Olmsted Falls Athletic Department is offering a variety of Summer Sports Camps for students in grades 3 to 12. All information and registration forms have been collected and posted together on the District website.